Then, a short while ago, my kids and I read the My Father's Dragon series and I knew that my boys would really love another dragon story if we could find one. We'd already read The Reluctant Dragon (linked to thoughts) and so I was looking for something different. I decided to bite the bullet and give Kenny & the Dragon a chance. And? I'm glad I did. We enjoyed the read (although it wasn't really different than anything we'd ever read before). I should start off (in the third paragraph) by telling you that Kenny & the Dragon is a retelling of The Reluctant Dragon. Tony DiTerlizzi writes and illustrates this new version, giving us a young rabbit named Kenny who makes friends with a book-loving dragon named Graham. (Ah ha ha.) He is elated to find another being who likes the same things that he does and the two enjoy some poetry and book discussion. Kenny lives with his mother and father who don't read many books themselves but they are supportive of Kenny's love of knowledge and also his new friend. Prior to meeting Graham, Kenny's only friend is George, an elderly gentleman badger, who owns a bookshop in the small village of Roundbrook. Kenny and George also meet up quite frequently to talk books and play chess. Kenny admires both of his friends greatly. As I mentioned, the opening paragraph of this book is a bit cheesy and made me anticipate a fluffy, just-publish-another-book-because-you-can read. 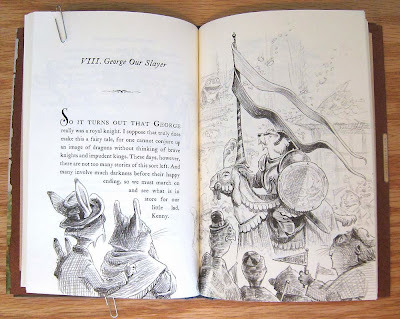 However, DiTerlizzi won me over with his illustrations and through my children's laughter. My boys (ages 7 and 5) really did enjoy this read (and I didn't feel guilty reading it to them since we've read the original story). DiTerlizzi heavily borrows from the original work and makes no bones about it. 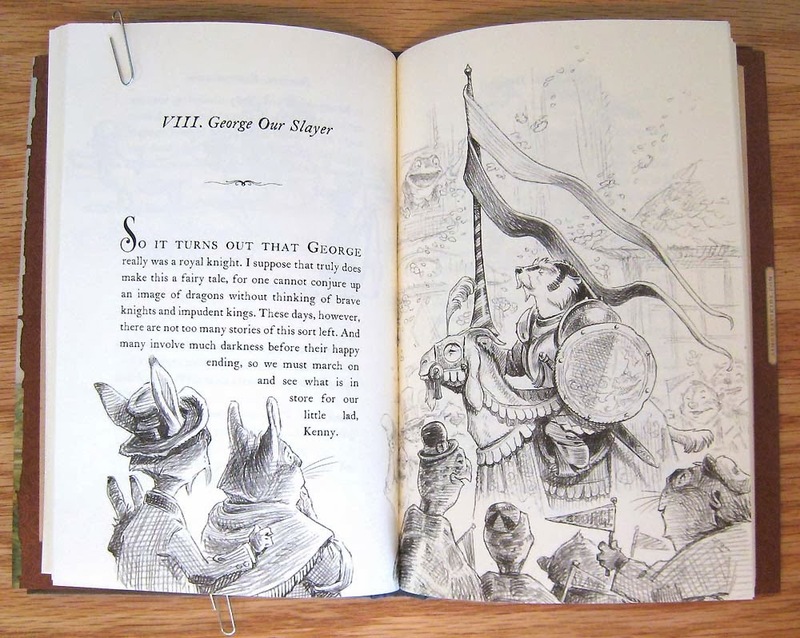 I liked that, actually, as it points the reader to this classic children's story - which is a good story! Kenny & the Dragon is both meaty and light hearted. The battle scene between Graham and George is a hoot and had my children in stitches. DiTerlizzi wins a bunch of bonus points from me for his positively delightful illustrations which make the book an all around pleasure. I highly recommend to you that you read The Reluctant Dragon, but I might also suggest Kenny & the Dragon as being a delightful retelling. I'm glad I didn't ultimately pass it by! 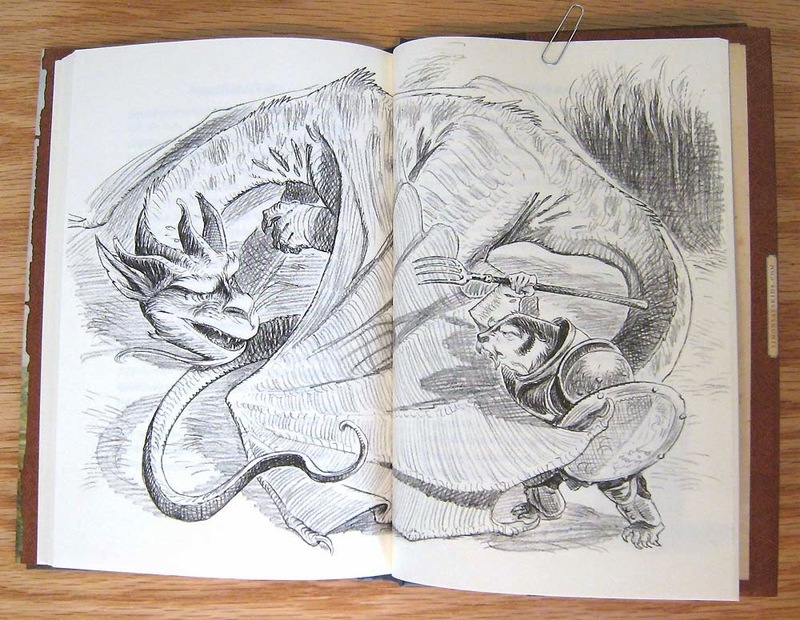 I don't think I ever told you about our reading of The Reluctant Dragon. We definitely enjoyed it, though M ran away in fear at one point. We had to wait until the next day to finish it; I assured her it had a happy ending without death. I wonder if Grahame's book is ALSO a retelling. I say that because the story seemed very familiar to me. Granted, I may have read it when teaching, but it seemed to be from my childhood. However, it was published in 1988, which makes me think I did not read it as a 12+ year old. 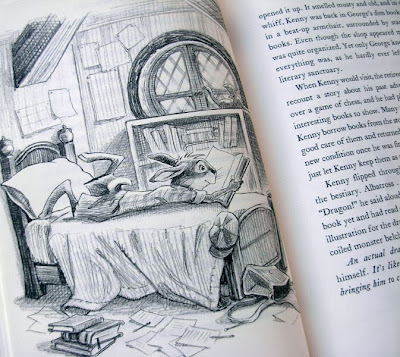 Kenny and the Dragon's illustrations ARE rather magnificent, aren't they!? Thank you for sharing!